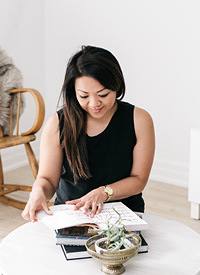 Thrifted Thursday with Lesley Metcalfe — Love On Sunday Love On Sunday | Interior Styling in Toronto and the GTA. Hi there, Love On Sunday readers! I'm Lesley and I'm delighted to be featured on Amy's Thrifted Thursday series. I'm a big fan of Amy's style, and I love reading about and seeing her projects and the images that inspire her. I've stopped by today to share my favourite thrifted piece of furniture with you. This piece was given to me from my boyfriend. It's an antique that had been in his family for years. I love browsing thrift shops for great furniture, but I was lucky in this case to have received a piece that comes with a traceable history. The grey-veined white marble top on this cabinet is definitely its best feature. It's complimented by intricate carved detailing in the wood below. This cabinet was in rough shape from years of use - one of the back legs was missing and it needed freshening up overall. I appreciated the classic, elegant features of the piece and I wanted to maintain them, but I also wanted to make it a little more modern. There were two large corbels at the front of the cabinet on either side of the doors that I removed (they were just a little too ornate for my liking) and I filled the holes they left with a wood filler. After giving the surface a light sand, I painted it with four cans of Krylon Gloss Black spray paint. I then applied a couple of coats of acrylic polyurethane so that it resembles a lacquer finish. This marble-topped cabinet is the bar area in my living room. It's large enough to offer both display space and functional space. I can display my frequently served bottles on top with some glasses, and extras in the cupboard underneath (I especially love the new antique silver tray I purchased, it works perfectly with this bar). Bar tools are kept in the drawer. There's enough space on the counter for pouring drinks and cutting up limes, with room to spare for a vase of flowers, or a lamp, or with whatever else I'm in the mood for styling my bar with! I hope you enjoyed reading about my favourite piece of furniture as much as I enjoyed sharing it with you! Please feel free to stop by my blog anytime at www.LesleyMetcalfe.com. Thanks very much Amy, for having me as a guest! If you haven't already done so, make sure to check out Lesley's blog to see her latest and greatest decor inspirations and projects. You can see more of the Thrifted Thursday Series here.